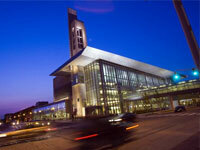 INDIANAPOLIS -- Today, Indiana University-Purdue University Indianapolis is presenting its Spirit of Philanthropy Award, one of the most esteemed philanthropy awards given by the campus, to individuals, foundations and corporations who share their time, financial resources and ideas with IUPUI. Each year since 1989, the IUPUI campus has come together for the Spirit of Philanthropy Luncheon and Awards Ceremony to recognize how important philanthropy and volunteerism are to IUPUI and the community. "These gifts play an important role in the success of IUPUI," said IUPUI Chancellor Nasser H. Paydar. "The spirit of philanthropy creates a legacy of opportunity, enables dreams to be achieved and supports innovation across Indiana." Sponsored by IUPUI and the IU Foundation, the luncheon will be emceed by Brad Holtz, director of programming for radio station WTTS, 92.3 FM. C. Daniel Yates, a partner with the law firm of Bose McKinney & Evans, and his wife, Diana, have supported Herron through the John Herron Society, hosted gatherings in their home and enthusiastically attend Herron events. "Dan is one of those unique individuals who is able to see the big picture and help position an organization for a strong future," said Dean Valerie Eickmeier. "Herron is proud to recognize Dan Yates as this year's Spirit of Philanthropy honoree." Kelley School of Business recognizes and thanks BSA LifeStructures for establishing a graduate fellowship that will support physician leaders and facilitate positive change in the nation’s healthcare systems. BSA LifeStructures has created facilities for some of the nation's top health care, higher education and research institutions. With offices in Atlanta, Austin, Chicago, Indianapolis, Kansas City, Raleigh and St. Louis, BSA LifeStructures has grown for three decades by not simply designing buildings, but providing inspired solutions that improve lives. Jamal Smith, former Indiana Civil Rights Commissioner and the district athletics director for Indianapolis Public Schools, has volunteered countless hours at IUPUI. by IUPUI, he co-chaired an inaugural Education Weekend in May 2014. As an IUPUI Dialogue Group member and advisor to Chancellor Charles Bantz, Smith served on the search committee for the vice chancellor for diversity, equity and inclusion. He also serves as an advisor for IUPUI's Great Lakes Equity Center. Dr. James Fritts, an IU School of Dentistry alum, has been a leading supporter of the IU School of Dentistry clinical building project and has provided additional student financial support over the years. Fritts earned a B.S. in education from Ball State and began teaching at River Forest High School in Hobart, Indiana, in 1959. He returned to school to earn his D.D.S. Fritts and his wife, Marilyn, made Rochester, Indiana, their hometown, where Fritts continues to practice dentistry. The school thanks Fritts for his loyalty, thoughtfulness and generosity to the IU School of Dentistry. Reinvesting significant dollars into the community continues to be paramount to Fifth Third Bank's overall focus. Major Fifth Third Bank investments include a $5 million gift to support the new Eskenazi Hospital, $100,000 to support a quality-of-life plan on the south side of Indianapolis, adoption of IPS Clarence Farrington School 61 and serving as title sponsor of Riley Hospital's The Gift of Hope Happens. Annually, local Fifth Third employees volunteer more than 3,000 hours serving on various boards and committees and providing financial literacy training to youth and adults through four major programs: Young Bankers Club, Financial Empowerment Mobiles, Dave Ramsey's Foundations in Personal Finance and EmpowerU. Chris Stout, who earned his associate's degree from the School of Engineering and Technology in 1979 and was awarded an Honorary Doctor of Technology degree from the school in 2013, and his wife, Karen, established the Dr. Chris E. Stout RISE Scholarship to support students of the School of Engineering and Technology. In addition to serving as a clinical professor at the University of Illinois, Stout is the vice president of the Department of Research and Data Analytics at ATI Holdings LLC. Stout has been honored with the Purdue University Distinguished Alumni of the Year Award and is an inaugural inductee into Purdue University's Hall of Fame. Linda Riccio, an occupational therapist by education, is a remarkable health care advocate who has shaped clinical and programmatic development in long-term-care operations for over 35 years. She currently serves as president of creative rehab strategies and vice president of clinical services for Vertis Therapy and Creative Health Solutions. Riccio enjoys a professional partnership with the School of Health and Rehabilitation Sciences and has established the Linda S. Riccio Occupational Therapy Perseverance Fellowship, a graduate-level fellowship in the Department of Occupational Therapy. An aggressive forerunner in implementing the latest construction technologies, Taylor Brothers Construction Co. is dedicated to excellent work, safety and giving back to the communities it serves. The Nina Mason Pulliam Charitable Trust and the School of Informatics and Computing have joined forces to provide real-world applications of informatics and computing to high school students with a goal of filling the critical IT workforce shortage. The Informatics Diversity-Enhanced Workforce initiative -- a year-round collaborative and project-based learning program focused on underrepresented minorities -- kicked off in fall 2015 at Providence Cristo Rey, Pike and Arsenal Technical high schools. Through innovative learning modules, informatics and computing faculty introduce participants to societal problems so students can create their own solutions using technology. The program also includes dual credit, incentives, mentorship and internships and prepares students to seek two- and four-year IT training programs. While most in the IUPUI community know the work of Sharon Holland and her husband, Joe, on behalf of the Indiana University Alumni Association, the Department of Athletics would like to thank the couple for their involvement with student-athletes and coaches. Sharon and Joe have contributed personally to the annual scholarship fund of the department for over 30 years and have developed relationships with hundreds of student-athletes, helping create links between these individuals' families and IUPUI. The couple has been instrumental in helping the IUPUI Department of Athletics promote its values to recruit, retain and graduate champions. The IU Robert H. McKinney School of Law is pleased to honor Michael D. and Nancie Freeborn for their tremendous philanthropic support and service. Michael is a 1972 graduate of the IU McKinney School of Law and has been a member of the school's board of visitors since 1999. Michael and Nancie are longtime advocates of the school. They recently established the Michael and Nancie Freeborn Civil and Human Rights Fellowship, which provides experiential learning opportunities for IU McKinney Law students interested in civil and human rights. Marianne S. Wokeck and P.M.G. "Mike" Harris had life-changing international experiences as young people. Because they believe all students should have the opportunity to immerse themselves in other cultures and to find their place in the global society, they created the P.M.G. and M.S.W. Harris Study Abroad Scholarship. the Institute for American Thought and serves as president of the IUPUI Faculty Council. Harris, her late husband, retired from Temple University, where he taught history, continuing as an active scholar and author until his death in 2013. Since Gene Bate was diagnosed with cancer in 2005, he and his wife, Nancy, have supported IU cancer research to show their gratitude for life-saving care provided by Dr. Larry Einhorn and Dr. Michael Robertson. In recent years, the Bates have been ardent supporters of the Chuckstrong Tailgate Gala, an event hosted by the Indianapolis Colts and head coach Chuck Pagano to benefit IU Simon Cancer Center research. In addition to sponsoring the event and serving on the event committee, Bate's company donates all of the NFL jerseys worn by event volunteers each year. Bate, a native of Evansville, is the CEO of Indiana Knitwear Corporation in Greenfield. Nancy, a native of Indianapolis, earned her undergraduate degree from the University of Michigan in 1975 and served as a teacher for visually impaired students. The School of Nursing is proud to honor Brenda Lyon with the Spirit of Philanthropy Award. As a distinguished alumna (BSN'68, MSN'71 and Ph.D.'81), professor emerita and benefactor, Lyon has made significant leadership contributions to the school for over 40 years. She is nationally acclaimed for her leadership in enhancing the statutory recognition of nursing and recognition of clinical nurse specialist (CNS) practice, and for contributing substantive knowledge in the area of stress and coping. Lyon's ongoing commitment to the success of the School of Nursing is reflected in her generous gifts to the Lois C. Meier Teaching Excellence Award, the Meier/Lyon Dissertation Award and the Emily Holmquist Professorship. With her recent planned gift to establish the Brenda L. Lyon Endowed Chair in Symptom Management Nursing, Lyon's legacy of supporting teaching, research and service focused on symptom management will endure in perpetuity. Interstate Optical Company Inc., which specializes in providing high-quality lab services, including unique and innovative growth resources for independent eye care professionals, is a firm believer in giving back to the optical industry and has supported the IU School of Optometry for over two decades. The company has contributed to many IU Optometry student organization fundraisers, is a significant partner of the school's alumni association and has underwritten the school's annual Alumni Waffle Breakfast for many years. In addition, Interstate Optical has been an important partner in supporting the growing annual Optometry Alumni Scholarship Golf Outing, which helps raise dollars for student scholarships. Irene and Bill McCutchen make philanthropy a part of their daily lives through their volunteer work and by giving generously. Both are active in higher education as volunteers: Irene serves on the board of visitors for the IU Lilly Family School of Philanthropy, and Bill is currently co-chairing a campaign for the Duke Divinity School. In 2014, Irene and Bill generously supported the endowment of the Eugene R. Tempel Deanship at the IU Lilly Family School of Philanthropy. This tremendous gift will help the school attract future deans of the highest caliber and will allow them to quickly and innovatively meet challenges, seize opportunities and fulfill the mission of the school to improve philanthropy to improve the world. Professor Emeritus Jeffery Vessely's IUPUI career was distinguished and extensive, including roles such as athletics coach, intramural sports director, dean of students, faculty council president and kinesiology department chair. During his 36 years at IUPUI, Jeff and his wife, Susan, supported the university and the School of Physical Education and Tourism Management in many ways, one of which was philanthropy. They are members of the Arbutus Society and the 1820 Society and have been recognized for 25 years of consecutive giving. Jeff routinely championed the school's faculty/staff campaign efforts, and the couple's support contributed to the school's success during IUPUI's previous capital campaigns. The couple's remarkable passion for student success was demonstrated for many years via scholarships. During fall 2015, they initiated an emergency fund for kinesiology students as a way to help students experiencing financial emergencies to stay in school. Jeff Vessely passed away in February 2016, and memorial contributions helped extend the couple's legacy. As part of its belief in comprehensive public safety, as well as its commitment to the community, the Indy Public Safety Foundation funded the Public Safety Forums hosted by SPEA and the IU Public Policy Institute. These forums facilitate discussion of some of the greatest issues facing public safety agencies and cities today. Founded by motivated civic leaders to enhance the safety and quality of life in the greater Indianapolis community, the foundation develops and supports evidence-based training, meeting first-responder needs, and combining development with community organizing to address public safety. SPEA is proud of its strong partnership with the Indy Public Safety Foundation to provide programming that helps build safer communities for residents across Central Indiana. In 2009, the Eli Lilly and Company Foundation made a $1 million gift to help establish an accredited school of public health at Indiana University-Purdue University Indianapolis. This initial gift served as a catalyst to attract additional funding to create the school and to raise awareness of public health needs within Indiana. Since that initial gift, Eli Lilly and Company has continued to support the school and has committed countless volunteer hours to ensure that the Richard M. Fairbanks School of Public Health is well supported. Executives from Eli Lilly and Company have assisted with curriculum development and have served on the school's national advisory council and alumni board. By investing $400,000 in IUPUI's Center for Earth and Environmental Science, the Duke Energy Foundation funded two of its highest priorities: education and science. In addition to funding a new mobile science trailer that will enable the center to take hands-on outdoor lessons in science and the environment to students in grades 4-9 across the state, Duke Energy's gift will also support the expansion of new programming for students statewide. Each year, through the Duke Energy Foundation, the company dedicates a portion of its shareholder earnings to charitable organizations and educational institutions statewide, investing in areas where they can have the greatest impact. Annually, the foundation funds approximately $2 million in charitable grants in Indiana. Its investment priorities are education, particularly early childhood literacy and STEM (science, technology, engineering and math); economic and workforce development; the environment; and community impact. Referred to as a "champion of children" by a Marion County Juvenile Court judge, William Barton has devoted his research to benefiting youths who come into contact with the juvenile justice system. Barton, a longtime faculty member in the School of Social Work, also received the Annie E. Casey Foundation's Natalie S. Bimel Award for Outstanding Contributions to Juvenile Detention Reform. In addition to his teaching and research, Barton has shown his commitment to social work students by supporting a wide range of scholarships, including the Bradly Robert Lighty Memorial Scholarship, which assists students pursuing a BSW degree; the Sheldon and Natalie Siegel Scholarship, awarded to students showing a commitment to community organizing; and the Patchner Family Endowed Scholarship, which provides fellowships for students preparing for a career assisting people with developmental disabilities. Barton also gives to the Murray/Powers Research Symposium, which supports and recognizes research and scholarly efforts of the school's Ph.D. program. Transforming Youth Recovery is dedicated to helping universities like IUPUI build communities to enhance recovery success for students struggling with the disease of addiction. In fall 2014, the Division of Student Affairs' Office of Health and Wellness Promotion established Students in Recovery of Indianapolis, the first collegiate recovery community in the city designed to support students recovering from addiction. With financial support from Transforming Youth Recovery, the Students in Recovery of Indianapolis group is able to provide students with social activities, guidance and mentoring from a trained recovery coach, recovery advocacy and awareness projects, and on-campus meeting space. Dennis Sponsel and his company, RJE Business Interiors, have a long history of partnering with IUPUI. Sponsel donated furniture to enhance the Division of Undergraduate Education's academic and career development services, which serves over 6,500 undergraduates each year. Sponsel also worked with his network of business colleagues to create innovative environments by furnishing these areas with state-of-the-art accommodations. RJE Business Interiors provided furniture that created group spaces for advising, career coaching and the major connection library. In addition to his generous gifts to the Division of Undergraduate Education, Sponsel is very active in youth programs to give the underprivileged in Indianapolis a better chance to succeed. Each 2016 Spirit of Philanthropy honoree is receiving a CMYK silkscreen print of "Archetypes of Philanthropy," a drawing created especially for this year's celebration. This unique piece of art was created by Briqlyn Paige Mohrman, a Herron School of Art and Design student majoring in printmaking. Her work was chosen from a group of student pieces coordinated through the Basile Center for Art, Design and Public Life, which serves Herron students by connecting their talents with the community.